Dessa and Aby Wolf listen to a performance by the South China Normal University Choir. Photo by Yu Pei. Conducting workshops in China takes flexibility. Heavy traffic has a tendency to make just arriving at your destination a game of chance. And once you get there, sometimes your technical needs just can’t be met. 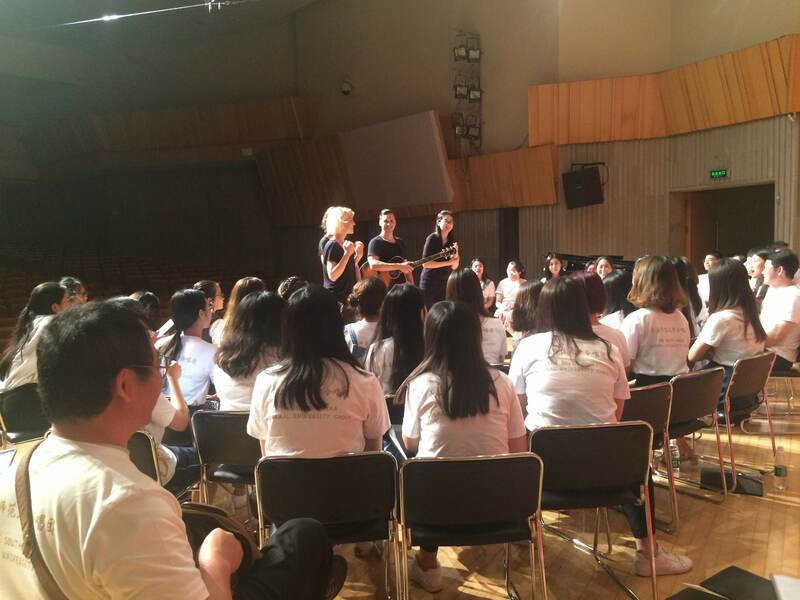 The Dessa in China tour experienced this on Sunday, May 27, when they visited the South China Normal University Choir in Guangzhou, China. The school’s PA system was down, so the group would have to perform without any tech. Dessa, Aby Wolf, Matthew Santos, and Arts Midwest President & CEO David Fraher with the students of the South China Normal University Choir. Photo by Yu Pei. The 60 students from the choir gathered on stage in the school auditorium. When Dessa, Aby Wolf, and Matthew Santos entered, they immediately cheered. “What if we’re not even good?” Dessa asked, laughing. The students just cheered louder. The workshop opened with three songs by the choir. Throughout their performance, it was evident—from their smiles, laughter, and dancing to accompany their music—that the students were enjoying themselves. Then it was Dessa’s turn. Because the group was playing acoustically, the students remained on stage, pulling their chairs in to form a small circle around the band. The result was a much more intimate performance than usual. Dessa, Aby Wolf, Matthew Santos, and interpreter Yu Pei conduct an intimate performance for students of the South China Normal University Choir. Photo by Emma Bohmann. There are so many important, meaningful moments that result from programs like Dessa’s Arts Midwest Global Exchange that it is easy to overlook the simple fact that Dessa and her fellow musicians are creating moments that are also purely enjoyable. And it is when we are having fun, engaging in moments of joy, that we fully open ourselves up to an experience. Nowhere was this more apparent than at Sunday’s workshop with the choir students. As Dessa, Aby Wolf, Matthew Santos, the choir conductor, and the 60 students sang together, as they shared a stage, they also shared the sheer joy that came from their exchange. And they didn’t even need a microphone.